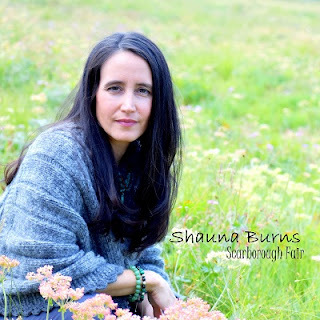 Shauna Burns, the seasoned Celtic inspired artist, is known for enchanting listeners with her soothing vocals, sweeping piano solos, and spiritually healing music. Salt Lake City, UT, Sep 29, 2017 – Shauna Burns, the seasoned Celtic inspired artist, is known for enchanting listeners with her soothing vocals, sweeping piano solos, and spiritually healing music. The singer-songwriter and pianist is set to release her cover single of an old-time classic, “Scarborough Fair,” on October 6, 2017 through the label Red Rock Music. 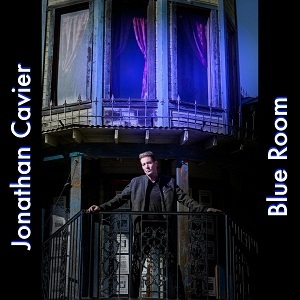 Los Angeles, CA, August 04, 2017 – Pop singer-songwriter Jonathan Cavier is excited to announce the release of “Blue Room”, the second single from his recently-released album of the same name.The track’s music video is now available via Cavier’s YouTube channel. The video and single release of “Blue Room” features a brand new mix of the song by renowned engineer NicoEssig (Katy Perry, Paul McCartney, Goo Goo Dolls).This new mix (now available on iTunes)has a brilliant, shimmery quality that highlights Cavier’s vocal delivery and the song’s keyboard arrangements. A song about “hope for the hopeless,” “Blue Room” was inspired by the Picasso painting of the same name and tells the story of the woman in the painting as Jonathan imagined while viewing the renowned piece of art. Emerging Songwriter/Singer Ashley J Announces New Steamy Single “Trapped,” Due Out May 19th! Orlando, FL, May 16, 2017 – Pop songwriter/singer Ashley J launches a new chapter in her emergence as contemporary pop artist with a brand new single, “Trapped.” The inescapable and smoky single is set for an independent release on all digital and streaming platforms May 19, 2017 via her production imprint, Bombshell Music, Inc.
Los Angeles, CA, May 10, 2017 – Pop singer-songwriter Jonathan Cavier is preparing for the release of his second solo album, Blue Room, which will be released via iTunes and all major digital outlets on May 12. Blue Room’s first single, “When You Come Around,” was recently released on April 21 and the video for the song will be released next week in advance of the full album. On “When You Come Around,” Sting’s influence can be heard as Cavier passionately sings about his desire to connect with someone special over an affective acoustic melody. There is raw emotion in both Cavier’s voice and lyrics on Blue Room showing an artist that has a deep strength in communicating emotion to his listeners. Blue Room’s sound is a continuation and maturation of the sound from Cavier’s first solo album, Premier, as both of these releases blend together pop influences from the 80s, 90s and music of today. On Blue Room, Cavier continues to “transport listeners to colorful three-minute worlds,” a process he started with the 2016 release of Premier. Cavier’s time in the atmospheric pop duo EyeTalk gave him years of experience and exposure in countries all over the world. With the maturation of his songwriting and composition and the wide array of generational influences on Blue Room’s ten tracks, one can see an artist truly coming into his own. Suggested Tweet: @JCavierMusic to release new #acoustic #pop album #BlueRoom on May 12! Check out http://caviermusic.com for more! “When You Come Around” is the first single from Cavier’s upcoming full-length album, Blue Room. Los Angeles, CA, April 23, 2017 – Pop singer-songwriter Jonathan Cavier is preparing for the release of his brand new single “When You Come Around” on April 21st, 2017. This is the first single to be released in anticipation of Cavier’s second solo album, Blue Room, which is slated for release May 12, 2017. 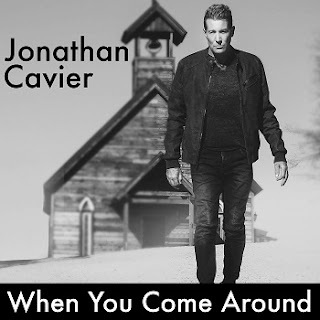 “When You Come Around,” written and produced by Jonathan Cavier and mixed by Jason Losett, features a delicate combination of atmospheric keyboards and shimmering acoustic guitars. “When You Come Around” is a song about loving someone with all your heart and being willing to do anything for them even if they aren’t always right by your side. Cavier vocals, which are bursting with emotion, are accompanied by light, airy instrumentation, painting a vivid picture of being deeply in love. 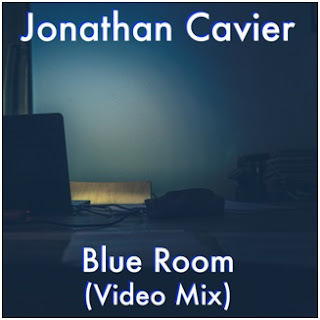 The ten songs on Blue Room follows in the tracks of Cavier’s first solo album Premier to merge his varied pop and rock influences from the 80s, 90s and today into a sound all his own. Extracting elements from a wide range of sounds and unique instruments, Cavier continues to “transport listeners to colorful three-minute worlds” on Blue Room through his composition, lyrics, and eye-catching visual accompaniments. 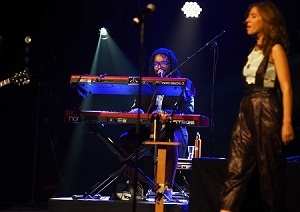 Keyboardist/vocalist Akie Bermiss performs a featured duet with Lake Street Dive lead singer Rachael Price on the band’s national concert tour. 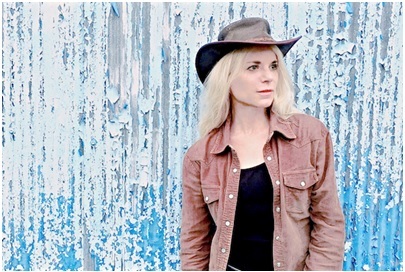 Over the past half a dozen years, Bermiss has become a visible contributor to the fertile Brooklyn music scene as a musician, songwriter or featured vocalist with a collective of upstart groups such as; FutureSoul band Aabaraki, the Screaming Headless Torsos, Miri Ben-Ari (the Hip Hop Violinist) and Rap sensa¬tion Soul Khan. He also birthed the Akie Bermiss Trio, independently released his first self-ti¬tled solo EP (via Rockwood Records in 2014) and continues to mine a loyal fan base performing frequently at cutting edge venues like Rockwood Music Hall , The Falcon, BAM Cafe and The Apollo Cafe, among others. The Lake Street Dive quartet features lead singer Rachael Price, Mike “McDuck” Olson (trumpet, guitar), Bridget Kearney (acoustic upright bass) and Mike Calabrese (drums). The new leg of their national tour will feature them supporting Jack Johnson on three shows, (July 8, 9, 10), four shows with Amos Lee (July 24-28), and one show with Daryl Hall & John Oates (Sept 1). The tour will also include several dates with special guests appearances by; Sweet Crude, Sarah Jarosz and Nathaniel Rateliff and The Night Sweats. A full schedule of all the new Lake Street Dive concert engagements through September 1 is listed. All dates noted with an asterisk (*) will feature Akie Bermiss on keyboards. Lake Street Dive with guest keyboardist Akie Bermiss getting a SO at the end of one of their shows, are gearing up for an extended tour of over 30 dates starting May 5th at the long running New Orleans Heritage Festival. 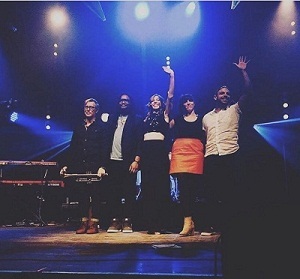 Pictured above is Lake Street Dive guitarist/trumpet player, Mike “McDuck” Olson keyboardist/vocalist Akie Bermiss, Rachael Price, lead singer, Bridget Kearney, acoustic upright bass, and drummer Mike Calabrese. 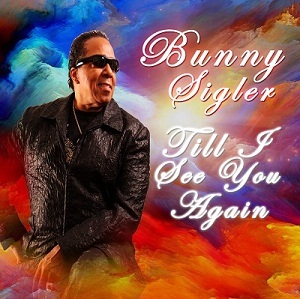 Los Angeles, CA, March 22, 2017 – Living legend, Philadelphia icon, and renowned R&B singer/songwriter Walter “Bunny” Sigler is excited to announce the latest addition to his ever-expanding discography – a new jazz single titled “Till I See You Again”. This song will be released on iTunes and all major digital retail outlets March 24 via Sigler’s own Bunz Music & Records label. “Till I See You Again” is the first single from Sigler’s upcoming album ‘Young at Heart’, which is slated for a summer release. ‘Young at Heart’ features Bunny’s fresh take on the genre of jazz, mixing tunes from the classic standards songbook with several of Sigler’s own compositions and his familiar R&B sound. Each of these tunes, old and new, features Sigler’s signature vocal performances that are bursting with emotion. “Till I See You Again” is no exception, from the opening harmonies to the catchy chorus, this slow ballad gives Sigler a foundation on which he builds a sound with elements of classics and modern tunes alike. The classic instrumentation invites Sigler’s emotional and powerful voice to paint a truly heartfelt and sweet picture of a man longing for a “special friend” while the two are apart. Sigler notes he has dedicated the song to the late Marvin Morrow who co-wrote the song with Bunny. Tasteful and restrained “Till I See You Again” is a strong start to ‘Young at Heart,’ Sigler’s follow-up to 2015’s “Bundino”. For more information and updates about ‘Young at Heart’ and Bunny Sigler, please visit his website at http://www.BunZMusicAndRecords.com. Bluesy Pop Singer-Songwriter, Brielle Von Hugel Releases “Stronger” Featuring B.O.B. (Exodus vs. Sweet & Sour Remix) Out March 20th! With her powerhouse pipes and undeniable passion, Brielle Von Hugel charmed millions of viewers on Season 11 of American Idol, reaching the semi-finals. New York, NY, March 15, 2017 – With her powerhouse pipes and undeniable passion, Brielle Von Hugel charmed millions of viewers on Season 11 of American Idol, reaching the semi-finals. The singer-songwriter has already released numerous original singles and cover songs that have garnered millions of YouTube views and Spotify plays. 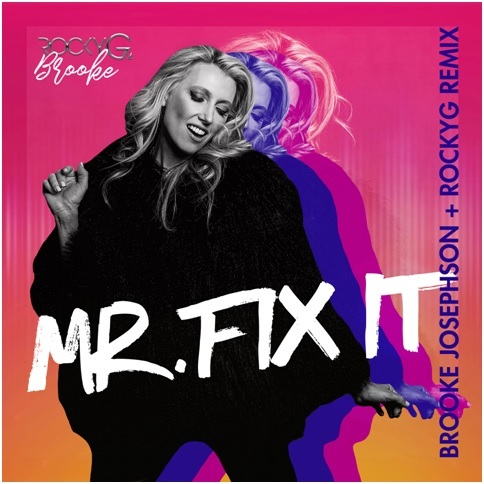 After great success with her single “Naked,” Brielle is gearing up to release a brand new remix of her song “Stronger” featuring B.O.B., mixed by House DJs Exodus and Sweet & Sour. The invigorating electronic mix will hit all digital platforms on March 20th, 2017. In her latest single, Brielle soars through each verse with airy and sultry vocals that build into a vigorous roar, showcasing the immense range in her voice. “Stronger” drips with pure honesty and passion as Brielle belts “say what you want, take down my walls, so I’ve been through it all; been through the fire. Day by day my flame is getting higher.” The song touches on each individual’s life struggles and ‘growing pains’ that continuously make each person stronger. Billboard charting B.O.B. continues the momentum with an intense and rhythmic vocal delivery. His natural rap abilities flow freely through the verse as he proclaims the obstacles that only make him live longer and push him to be more competitive. New York producer Exodus joins forces with House duo, Sweet & Sour to transform this pop single into an upbeat dance track. The rising producers combine elements of electro, progressive and tropical house to create an irresistible and breezy spring release. Brielle just finished a North American tour with internet sensation Postmodern Jukebox and will be jetting off to join them again in Europe starting March 20th. Susan Blond/ Susan Blond Group, Inc.